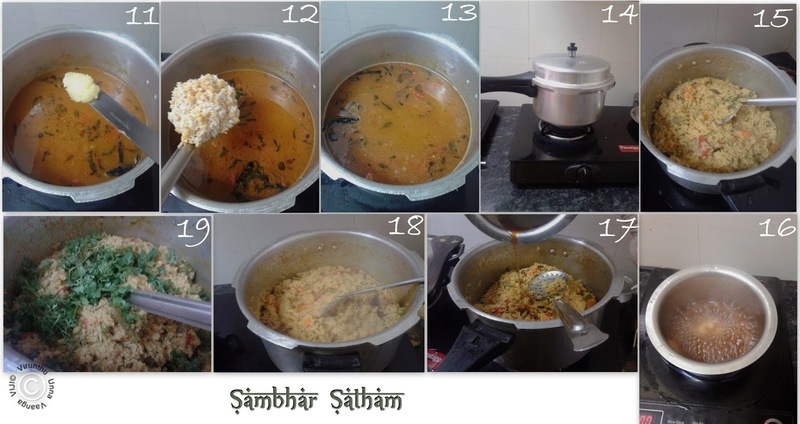 Hi friends, Sambhar is the very common in South Indian homes. 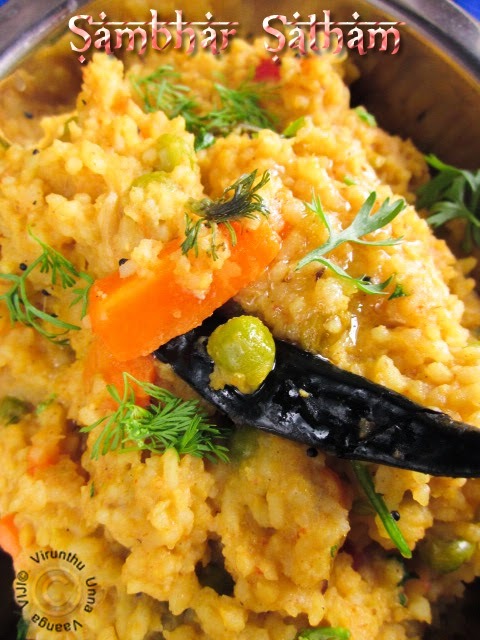 Sambhar rice is a easy and healthy one pot meal, easy lunch box recipes too. 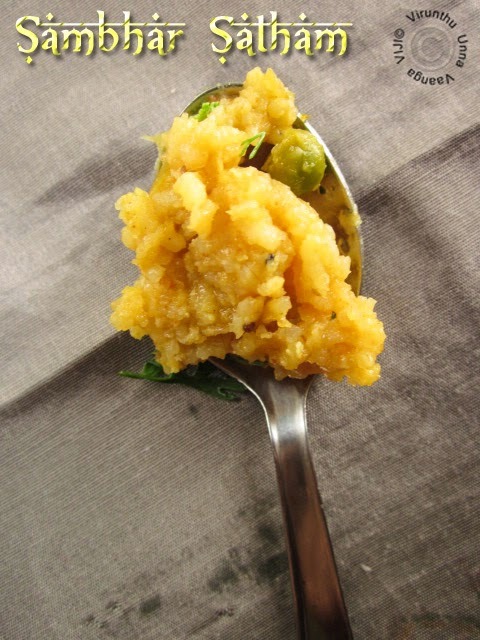 I already posted Arisi paruppu satham which is Coimbatore special cuisine and we used to make it often. 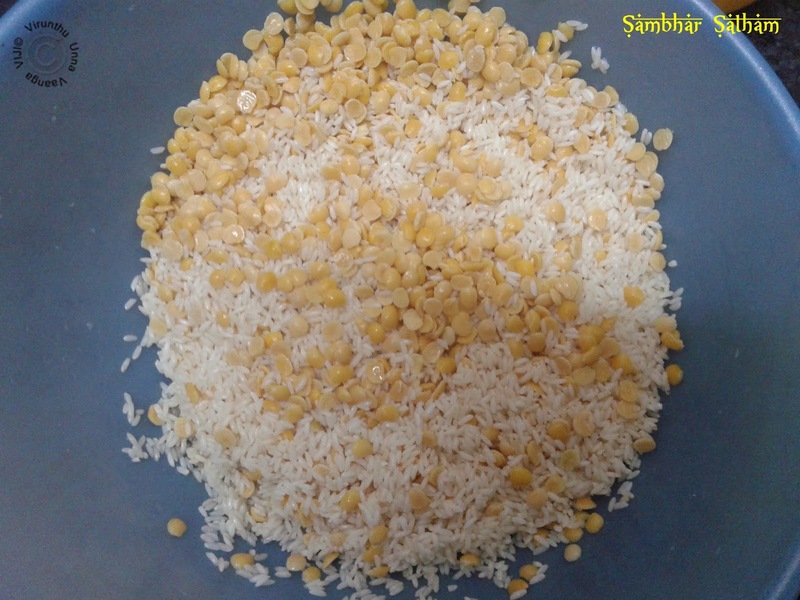 Sambhar rice is a version of bise bela bath but here I won’t use any special powder. 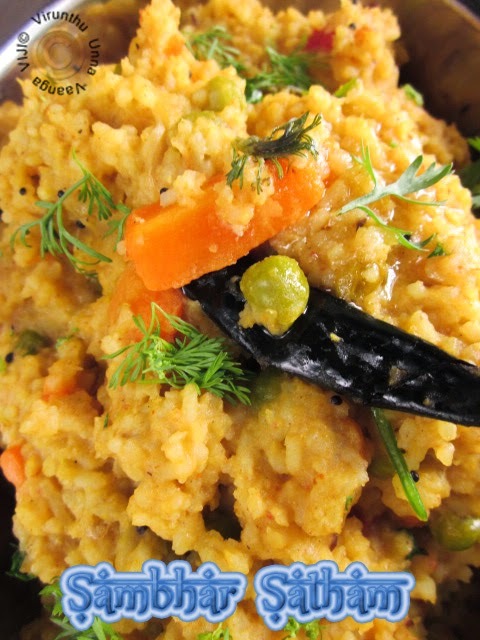 Sauted vegetables with tempering and cook with rice and dal together to give aromatic sambhar rice. 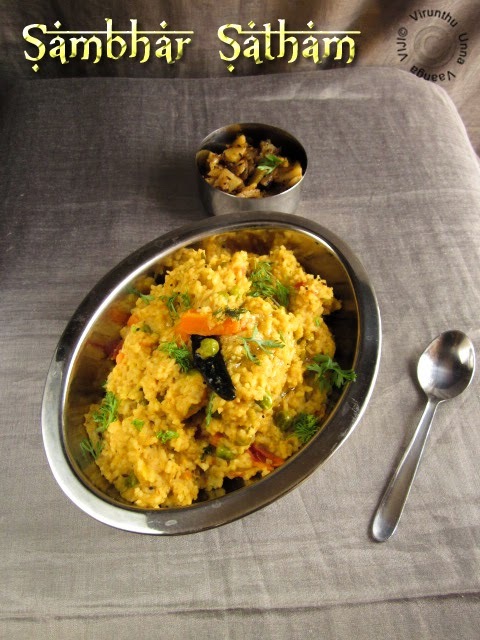 The rice will be good mushy and suits well with pappads and potato fry… It is kids’ friendly recipe with loads of nutrition. 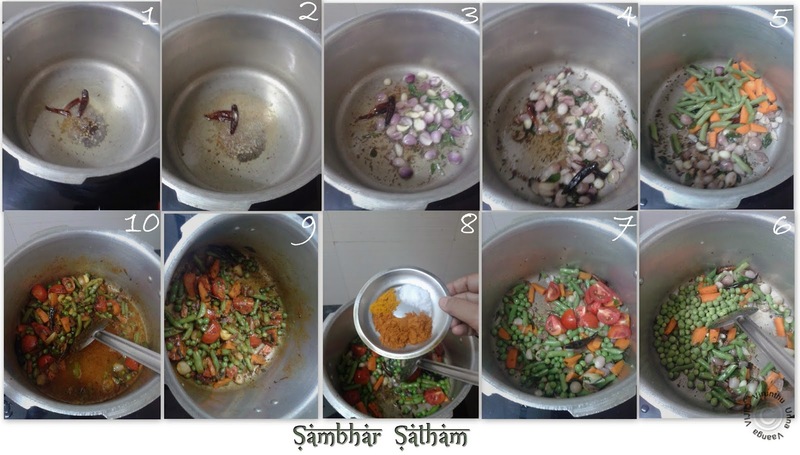 Coriander leaves – Few, to garnish. 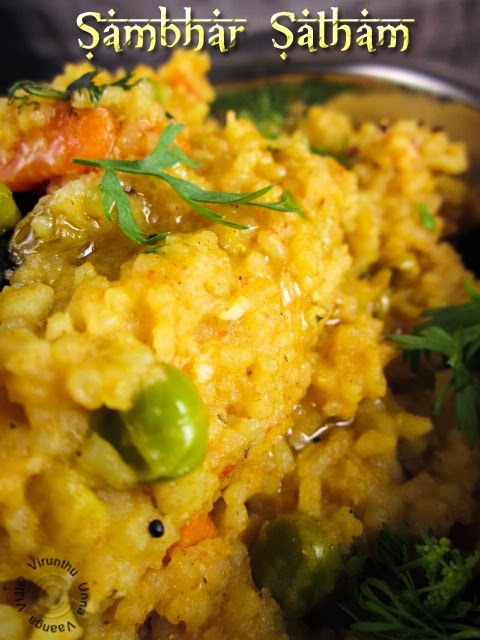 Soak the rice and dal together for 20 minutes. Heat oil in pressure cooker; add fenugreek, cumin seeds, mustard, urad dal seeds wait for splutter. Add hing and red chillies, then add shallots, garlic and curry leaves, sauté it till translucent. Add the carrot, beans, peas and sauté it well. Following by add tomatoes and sauté it for 5 minutes or tomato turns mushy. 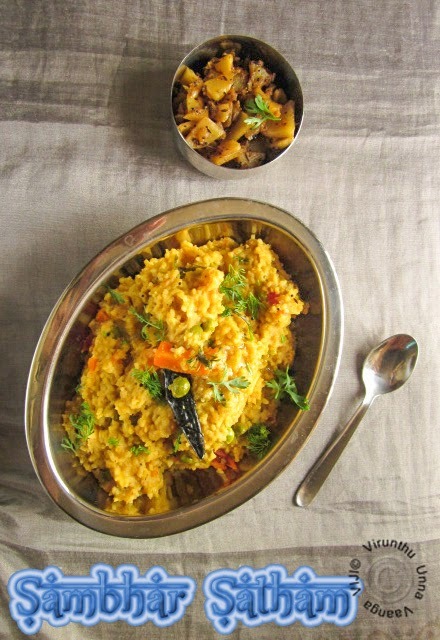 Add turmeric, sambhar powder and salt and stir it once, allow cooking till the raw smell goes off. Now add water, tamarind extracts and then rice and dal mixture and add ghee to the mixture mix it well. Cover the pressure cooker with lid and put vent while pressure out, and keep it for 5-6 whistles on high flame. Then switch off the flame, wait for reduce the pressure and open the lid, garnish with coriander leaves and dash of ghee. 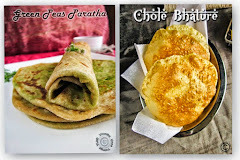 Serve it hot with potato fry and papad. I forgot to add tamarind extract while adding water, so I boiled the extract once and add to the cooked rice and cook it for 2 minutes, but am sure no compromise on taste. 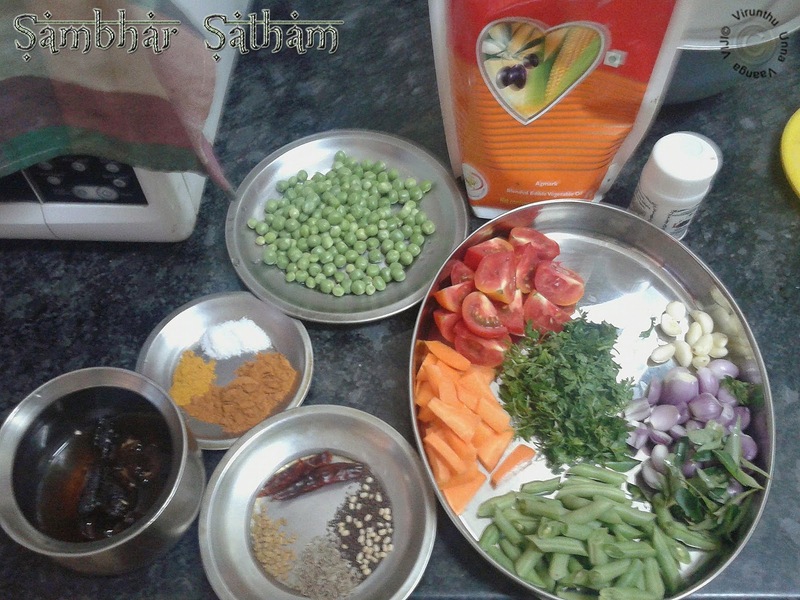 If you love masala flavor, add 1 Tsp garam masala. You can add your favorite veggies. 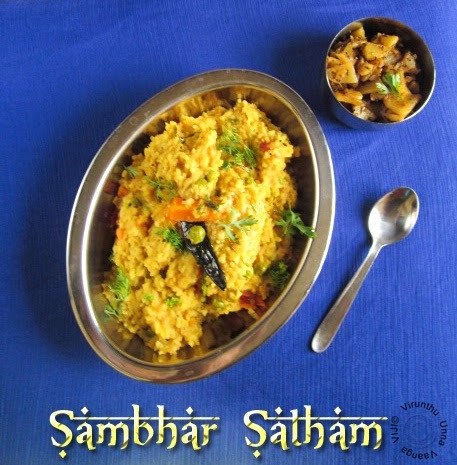 NUTRITIOUS AND DELICIOUS SAMBHAR RICE!!! Healthy and very comforting meal. 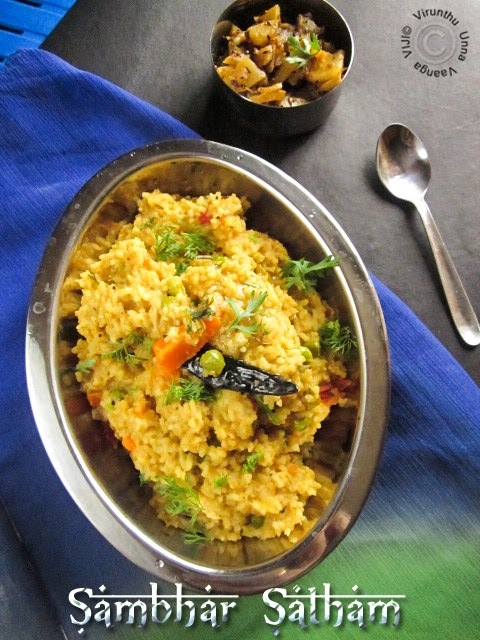 wow super Viji sambhar rice is calling me va va :) looks so delicious and yumm !! tempting me !! 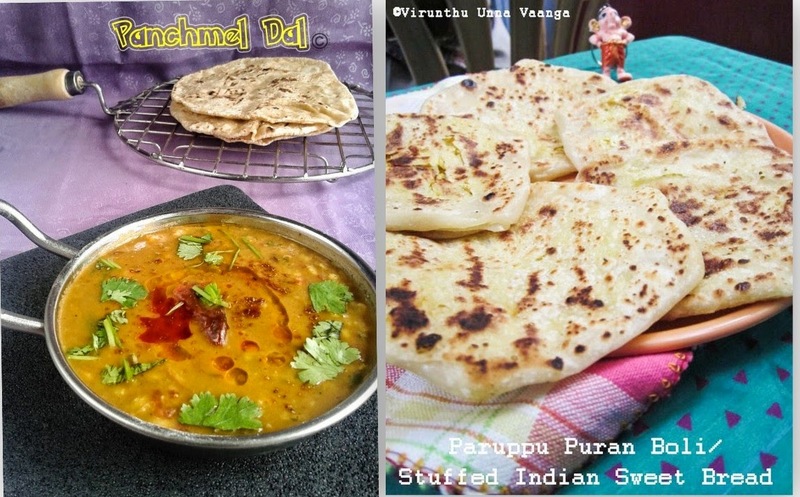 Good vegetarian Indian food in Australia. They also serve meat except for pork, though they do not have certification. We had the masala dosa and it was filling. 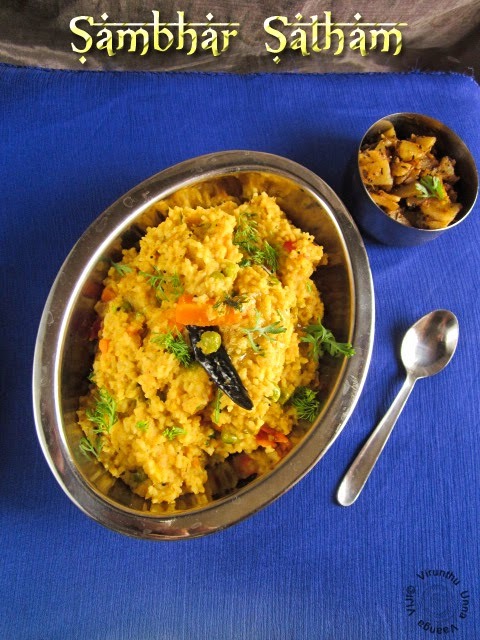 The rice and vegetarian dishes go well too. Location is central along Flinders street, which is very close to Federation Square and Flinders train station.